LeptiTrim6 is one of the most effective and healthful weight-loss products available today. The LeptiTrim6 SYSTEM with Colostrum has been specially designed to take off inches and weight while improving body health. This comprehensive system was created to reset your metabolism allowing for permanent weight loss. The LeptiTrim6 SYSTEM includes Daytime Capsules, Nighttime Formula and chocolate and vanilla meal replacement shakes. It all works together helping you synergistically lose weight naturally. Easy and fast! 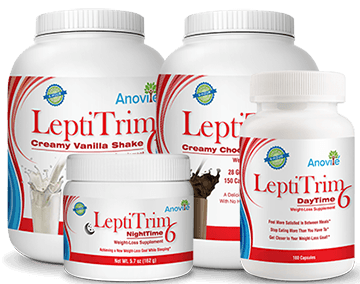 The cornerstone of the LeptiTrim6 family of product’s is based upon a substance called Leptin. Leptin is all natural and found in substantial quantities within our Colostrum6! This enhanced synergistic formula is designed to help you stay in control. LepiTrim6 can help you experience your desired weight and achieve your long-term health goals. General Dosage: Take six (6) capsules; either two (2) capsules three times per day or three (3) capsules twice per day! Another Great Option: Take four (4) capsules at 3:30pm and the last two (2) capsules at 6:00pm (this will help with evening cravings)! LepiTrim6 helps fill the communication gap between your stomach and the hypothalamus (the overeating mechanism), which puts you in control of how much you eat! LepiTrim6 helps curtail cravings for sweets. It isn’t wrong to want or even have some sweets, but most people find they aren’t in control and overindulge. This product will help limit the amount of bad carbohydrates. LepiTrim6 helps balance the body’s thermostat (the thyroid) for a better, natural thermogenic burn. The best energy source is fat and by getting your thermostat working properly, you can experience much more energy and lose inches! LepiTrim6 helps increase your lean muscle mass, which is a large part of your fat-burning engine, allowing you to burn more calories! It helps balance body chemistry which helps to overcome insulin-resistant weight gain and has a positive impact on your adrenal functionality, as well as blood pressure!